An epic, 8 mile climb to Observation Point, a jaw-dropping promontory 6508 feet above sea level on the Canyon’s northern end. The trail features a very strenuous, steep ascent and has absolutely stunning views for almost the entire trek. 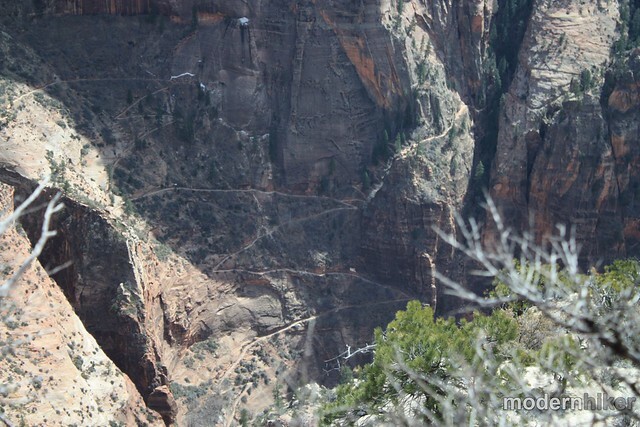 The peak is higher than nearby Angel’s Landing and is definitely less crowded. 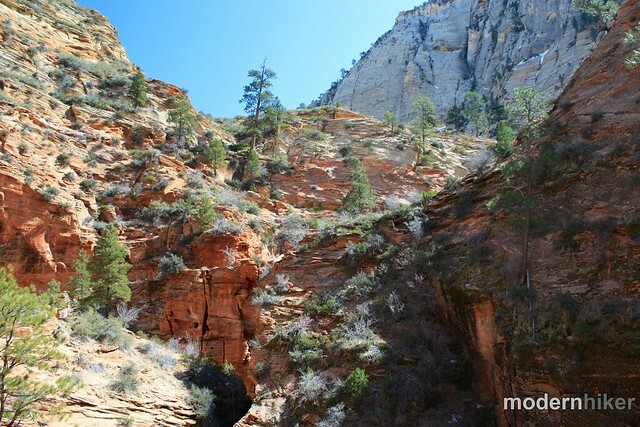 If you’re feeling extraordinarily adventurous, you can also tack on a side trip to Hidden Canyon on your way back down to the trailhead. 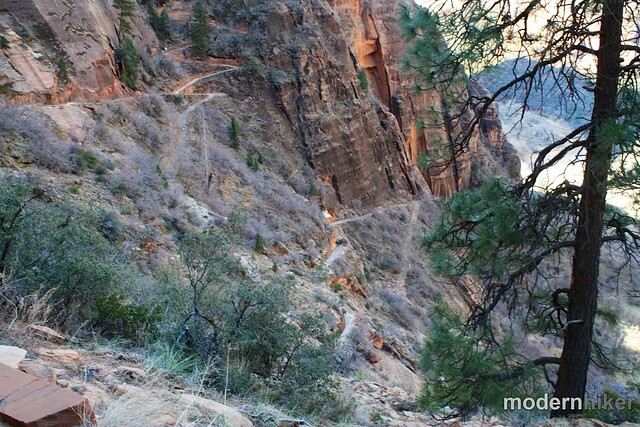 This was my favorite trail in Zion. 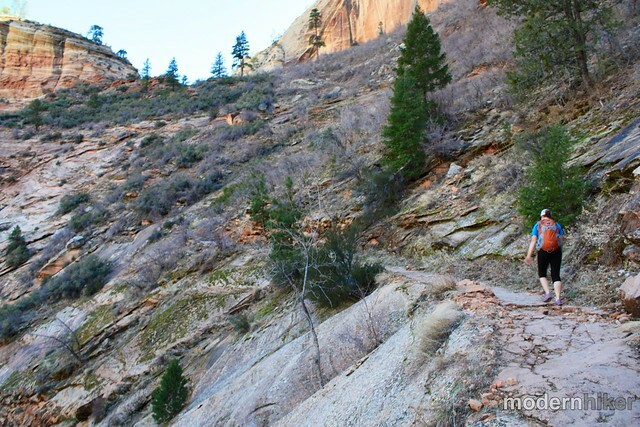 After getting spooked by the chain trails on Angel’s Landing, I was determined to follow it up with something to regain my hiking confidence – a trail that was longer, steeper, and more rugged … so I looked to the other side of the Virgin River and headed toward the Observation Point Trail. 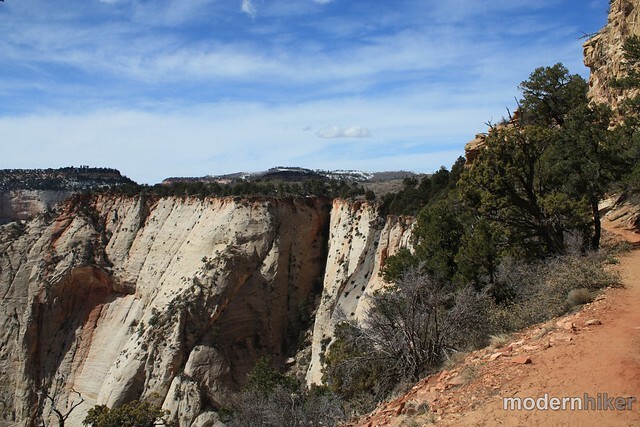 This route begins at a small parking lot that’s also the trailhead for two other routes – the very easy nature trail of Weeping Rock and the short but adventurous route into Hidden Canyon. The trailhead area may be crowded but the crowds will almost definitely thin out once you get past the spur for Hidden Canyon. 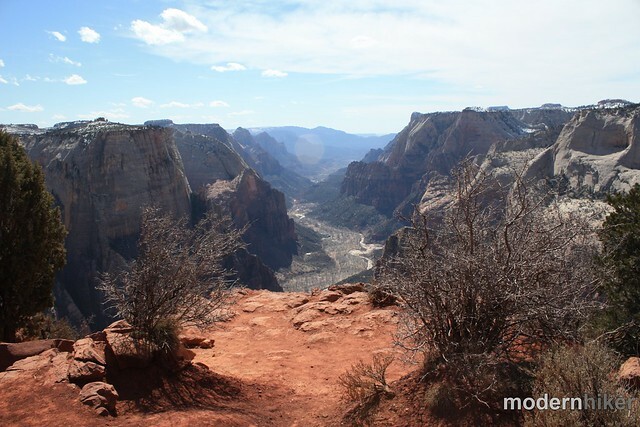 Cross a small bridge on the south side of the parking lot and note a plaque about the region’s logging history – when Mormon pioneers first settled in Zion, they needed access to the more solid timber on the Canyon’s rim. 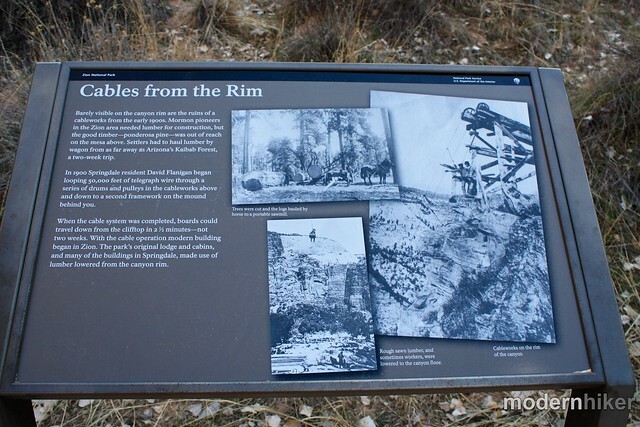 A few trails were cut into the canyon walls but transporting large quantities of lumber proved very inefficient – until a cableworks was built in the early 1900s to lower logs from the rim to the floor. The cableworks closed in 1930 but some of the structures still remain. You can just barely make them out from the floor but you’ll have a better view later on. The trail starts out on a sidewalk before moving to a dirt single track. You get just under 2 tenths of a mile before the trail starts making its no-nonsense switchback ascent by cutting right into the canyon wall. You’ll gain about 745 feet over the next mile. If you got to the trailhead early enough in the morning, you’ll have some shade from the canyon walls. If not – good luck. There’s pretty much no shade on the entire route – but at least you’ll enjoy watching the canyon floor get farther and farther away from you at every switchback conquered. 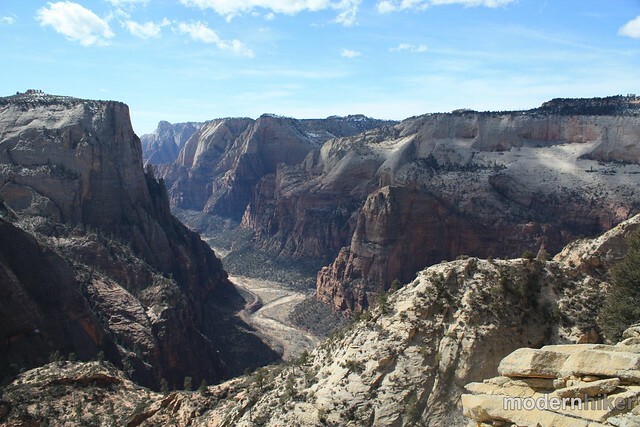 Directly across the canyon from the switchbacks, you’ll be able to see Angel’s Landing, the Organ, and the Big Bend of the Virgin River, too. 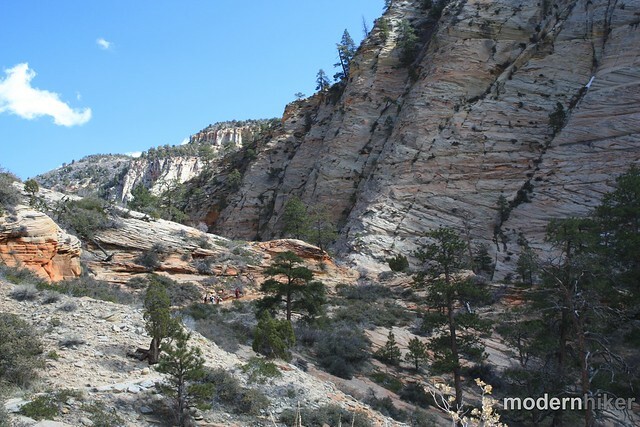 At the 0.7 mark, you’ll pass a bench at the junction with the Hidden Canyon Trail. 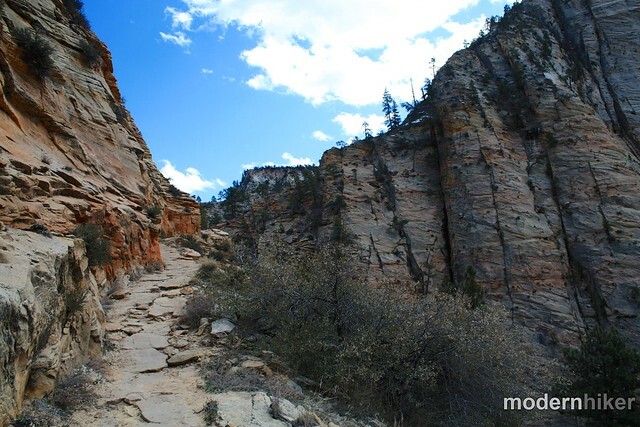 This short but steep trail climbs up into Hidden Canyon, a rugged but incredibly picturesque hanging canyon that remained undiscovered by settlers until 1927, when a climber attempting to ascend the Great White Throne fell here and had to get rescued. The Park Service cut a trail a half-mile into the canyon but most adventurous hikers can continue their hike by scrambling for another mile. Experienced technical climbers can make it all the way out to the rim with a permit. Good descriptions of those routes can be found here, and Kolby Kirk has a great video of one of the more harrowing sections of official trail at his Vimeo page. I was planning on tackling this side canyon on my way back down from Observation Point, but just didn’t have the gas in me by the time I got back down. Although some people do both in one trip, doing either route by itself would be considered a full day of hiking for most people. 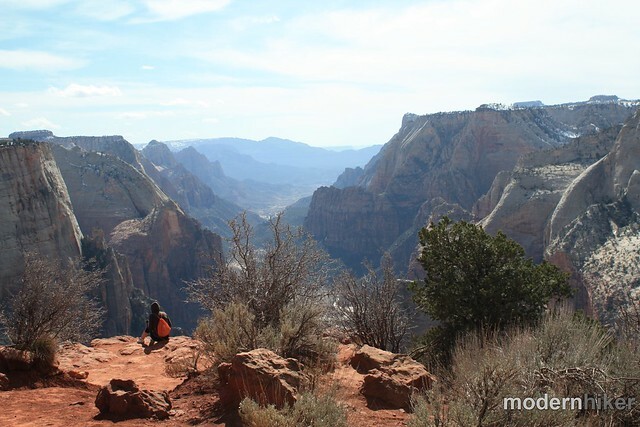 Take a break on the bench for a moment or continue up the switchbacks toward Observation Point. 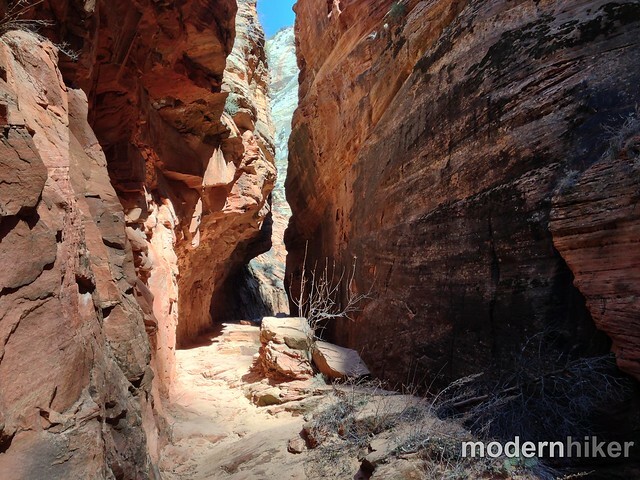 For the next 1.4 miles the trail skirts across the edge of Echo Canyon, a steep slot canyon that cuts through the rock in a northeastern direction from the trailhead. Initially, the drops will seem a bit staggering, but as the trail continues, the floor of Echo Canyon will eventually rise to meet it. 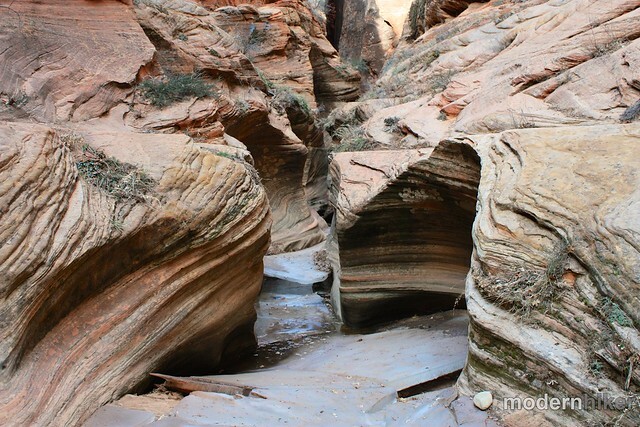 After you hike through the slot, the trail almost becomes an entirely different beast. The red canyon walls of Navajo Sandstone start to give way to the lighter Temple Cap and Carmel formations and the trail starts to take on more of an alpine feel – mostly because the shadows of the nearby mountains and stronger wind currents tend to make this area cooler. This part of the trail is really quite wonderful – you’re completely out of view of the Valley below and most likely by this point any crowds near the bottom of the trail have thinned out considerably. The hard work of the trail isn’t done yet, though – from the slot canyon to the summit plateau you’ve still got 1183 feet of elevation gain to go. 2.1 miles into the ascent, you’ll pass a junction with the East Rim Trail, which connects to the eastern backcountry of the Park. From here, you can get to the summit of Cable Mountain to see those cablework ruins up close and personal, but it’ll add more than 11 miles to your trip. Most people do that peak from a trailhead near the park’s East Entrance. Instead, continue the relentless climb up toward Observation Point. 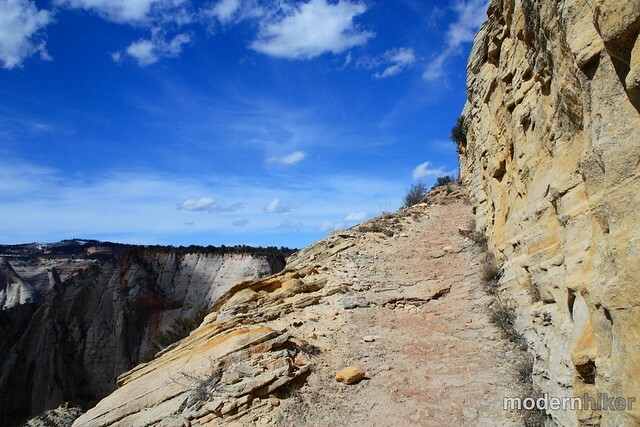 For just under the next mile, the trail clings to the side of the Observation Point formation and makes a series of long, steep switchbacks upward. The trail is definitely wide enough, but there are several places when there really isn’t much between you and the canyon floor. If strong gusts of winds kick up (as they did when I was coming back down), you might end up huddling against the wall a a few times – but at least you’ll have some amazing views. 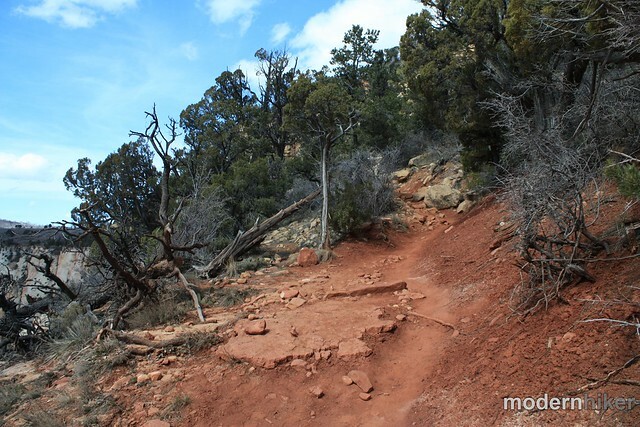 Eventually you’ll notice the trail turns from hard gray rock to soft, reddish dirt as you near the summit plateau. You’ll also be able to see Observation Point itself, reaching out from the plateau toward the canyon below. Once you reach the plateau, it’s about 0.7 miles to Observation Point. 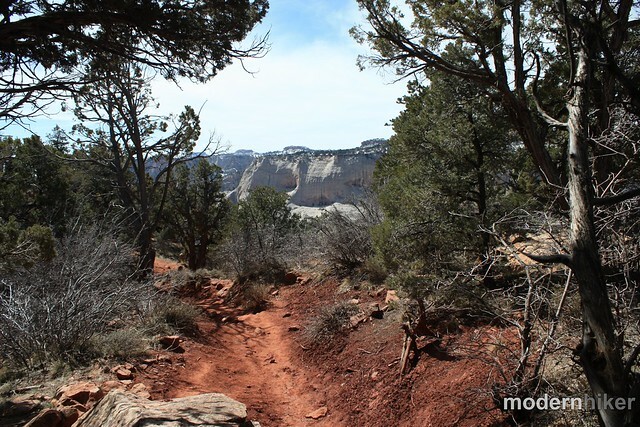 The trail moves inland a bit as it reaches a junction with the East Mesa Trail and loses the views for a while, but when you start making the approach to the Point you’ll catch glimpses of the canyon from both sides of the trail and it’s hard to contain your excitement. Once you reach the Point itself, I think you’ll find your excitement was justified. Enjoy your hike back down. 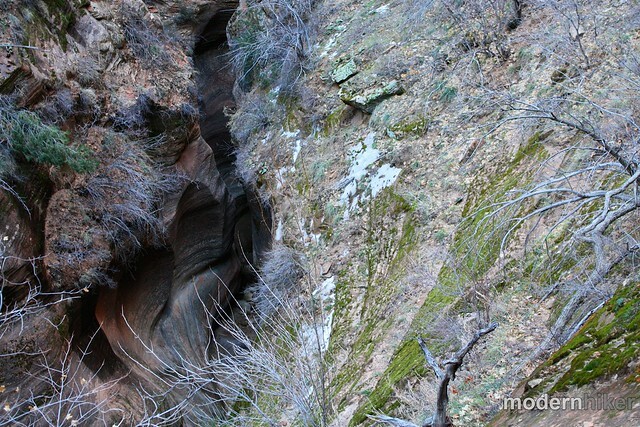 If you’ve still got energy, consider a side trip into Hidden Canyon – or at least take a quick walk up the nature trail to Weeping Rock near the trailhead. Then go get yourself a big meal. You definitely deserve it after this trek! Very good. 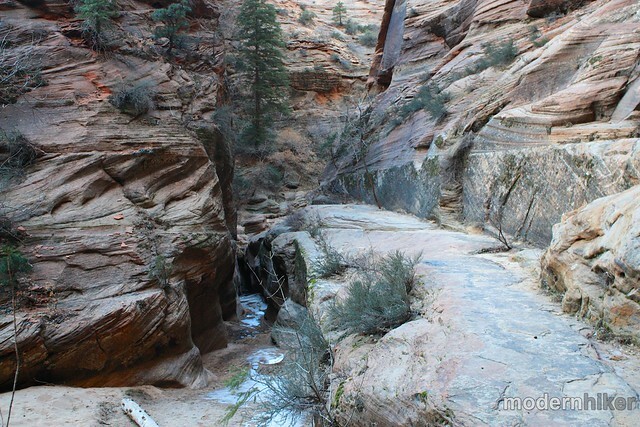 Those with fear of heights should know there are a few sections of this trail that have very steep drop-offs, both above slot canyons and on the cliff face of Zion Canyon itself. The trail is never narrow enough to cause real concern, though. 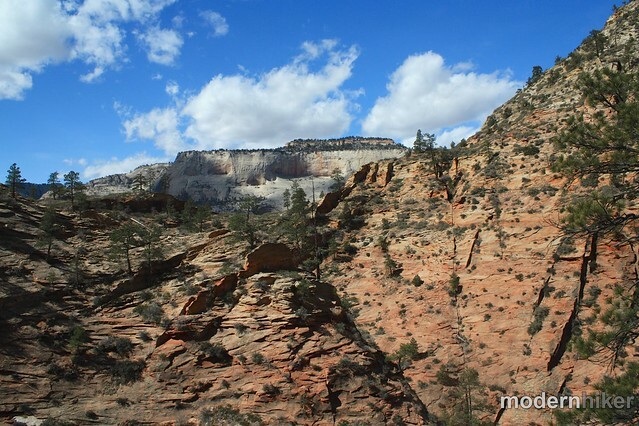 Zion National Park runs a Shuttle Service for most of the year. Take the shuttle to the Weeping Rock stop. 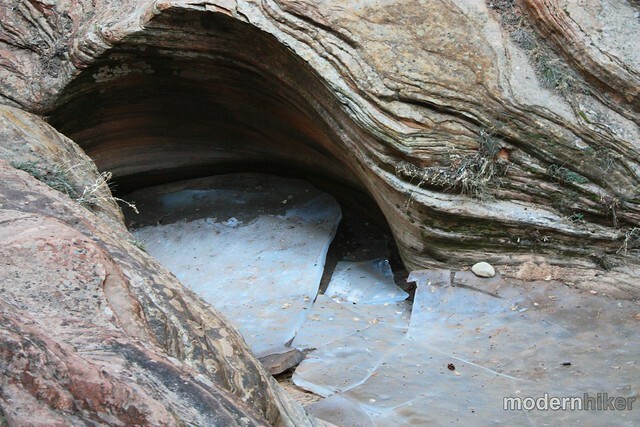 You'll see signs for the Weeping Rock, Hidden Canyon, and Observation Point Trails on the south side of the lot. If you're traveling in the winter, there is a small parking area. 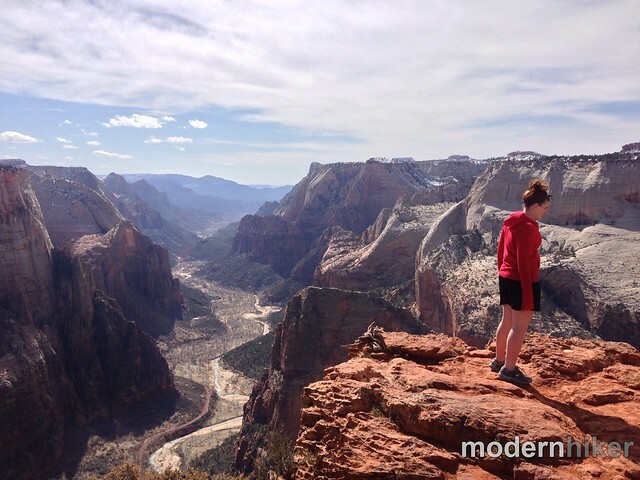 Casey - Thank you for such an insightful summary of the Observation Point hike. This seems a lot more pleasant to anticipate than the trek up to Angel's Landing. My question relates to what you would recommend should we encounter a summer thundershower or high winds: Would it ever really rain hard enough to sweep you off the trail? With events of high winds...is it best to keep moving toward a more protected area or just stay in place and brace agains the wall as your article suggested? Appreciate whatever wisdom you can impart! Am heading to Zion in late July. Thank you. 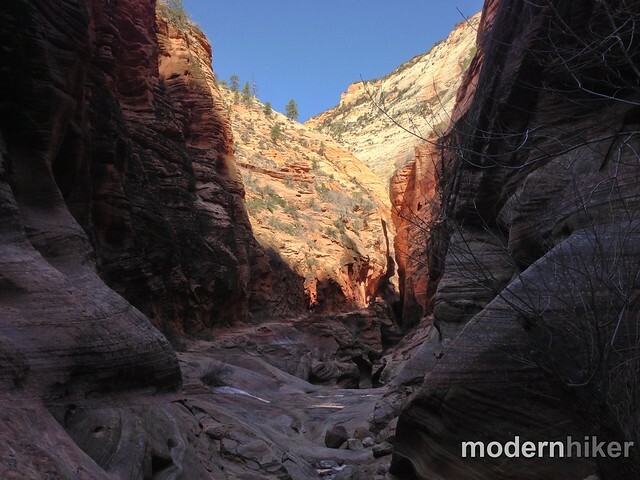 I fell in love with Zion National park when I was there about 3 years ago. Unfortunately I wasn't feeling well and feeling touch of vertigo so just took my sweet time to Angels Landing (skipped top part) and part of west rim. And next day The Narrows. Absolutely amazing!! A buddy did Observation Point and said it was epic. I absolutely will be back to do it!! :-) Thanks for the great article on it. Cheers, Dave from Vancouver, BC. Ha - yes, my legs were definitely sore after Observation :) I took the next day to do some of the park's shorter hikes to recover. Glad you enjoyed the write-ups and the parks! 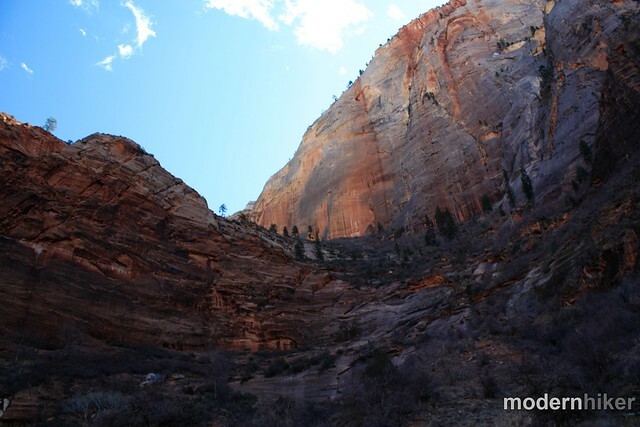 Zion's a magical place, isn't it? Thanks for the write-up! 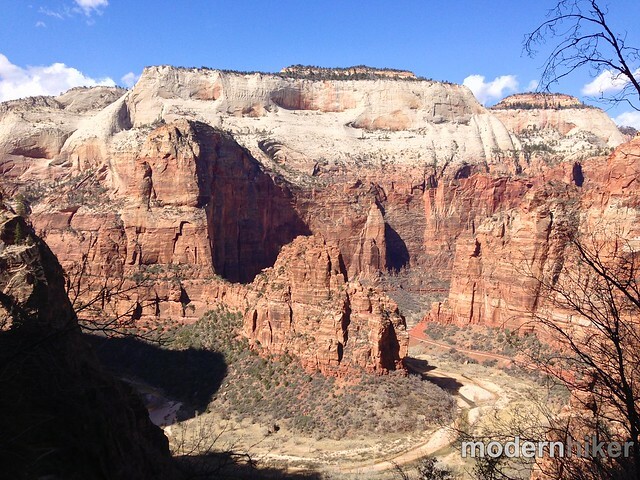 We just got back from a family trip at Zion... did Angel's on Saturday and Observation on Sunday. I totally underestimated Observation and don't think I can do two strenuous hikes like that back to back again. Nevertheless, I really enjoyed reading your write up on both hikes especially since both hikes are still so fresh in my mind.